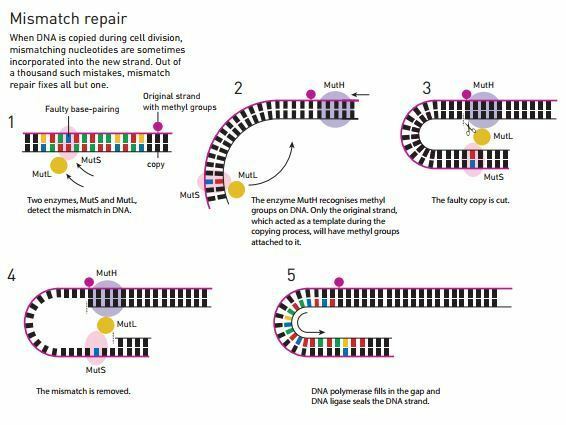 When faced with errors in genetic information brought on by cell replication, Paul Modrich showed that the cells use a process called mismatch repair to reduce problems. Their work details how cells repair damaged DNA and preserve genes. 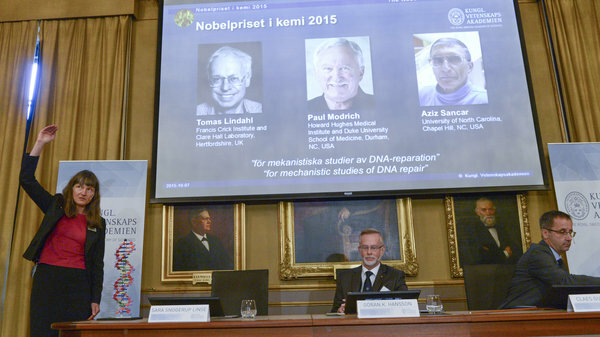 And now three scientists — Tomas Lindahl, Paul Modrich and Aziz Sancar — have won the 2015 Nobel Prize in Chemistry. Their work promises years of better treatment and better drugs. The three researchers carried out their work separately, unearthing different mechanisms cells use to fix problems in a range of cells. Lindahl, born in 1938, is a Swedish citizen. Modrich, born in 1946, is a U.S. citizen — as is Sancar, who is also a citizen of Turkey. Like Modrich, Sancar was born in 1946. In the 1970s, Lindahl showed that contrary to previous beliefs, DNA decays "at a rate that ought to have made the development of life on Earth impossible," as the Nobel Prize committee puts it. He then showed how cells constantly use base excision repair to repair this decay and prevent the collapse of our genetic information. Working on how cells recover from damage sustained from sunlight or carcinogenic substances, Sancar mapped out how cells use nucleotide excision repair to correct defects. Modrich solved the puzzle of how cells correct errors that arise when cells are replicated, finding that they use mismatch repair to sharply reduce the frequency of errors. In making these discoveries, the researchers also laid the groundwork for understanding how flaws in these cellular repair systems cause hereditary diseases — and how they affect the way people&apos;s cells react to changes brought on by cancer and aging. Lindahl has said that cancer is widely thought to be a disease of genome instability and DNA damage. "The more we know about how DNA is damaged and how it&apos;s repaired the more effective we can be in devising methods to eradicate cancer cells specifically without harming normal cells," he said at a March conference at the National University of Ireland in Galway. Modrich earned his Ph.D. from Stanford University and now works at Duke University&apos;s School of Medicine; Sancar earned his Ph.D. from the University of Texas at Dallas and currently teaches in the University of North Carolina School of Medicine. Lindahl earned his Ph.D. from the Karolinska Institutet in Stockholm and is now an emeritus leader at the Francis Crick Institute and Clare Hall Laboratory in Britain.